Fellow Crusaders, it is approaching that particular time of year where we all go a little crazy over college basketball. 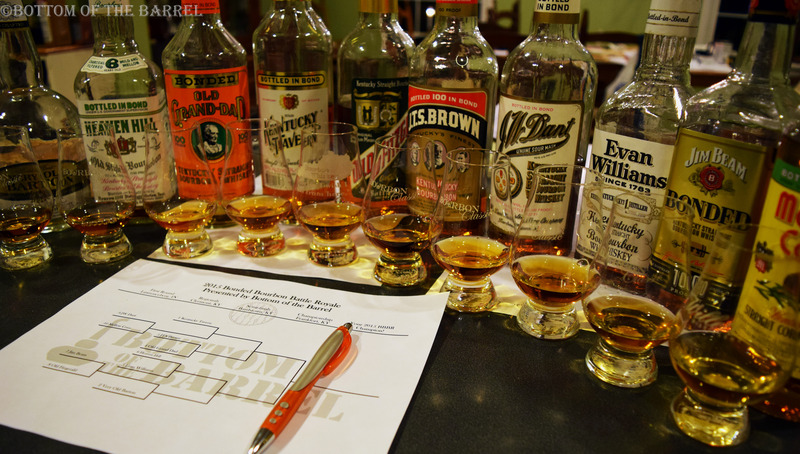 In that spirit, we’ve created a little challenge to pit bottled-in-bond bourbons against one another in a tournament of champions. So as to not ruin the surprise, and allow you to try it for yourself if you wish, we’re giving you our bracket complete with seeding and will release our results later on. There is also a blank PDF provided below if you want to make your own challenge for 10 of your favorite contenders. For this challenge, we decided to include most of the bonded bourbons that are readily available. If you’ve noticed a couple missing, kudos to you true Crusader! We decided to not include Rittenhouse, as it is a rye, and to omit the E.H. Taylor line as well as Henry McKenna as they are extra aged into a different division. Mellow corn was included, a corn whiskey, mostly because we were interested to see if it could beat anything. Our bracket was performed blind, with a kind assistant providing us the one on one pairings (or games) and progressing through the tournament without telling us which brand won each round and which pairing we were on. We highly recommend you do the same, as it adds to the fun. Give either our bonded tournament a try or create your own on the blank document and share it with us on Facebook or Twitter! We’d love to see your results! Cheers! Previous Post Interview with author Albert W. A. Schmid! Next Post I.W. Harper Returns to the U.S.